Eugenia Cooney is a YouTuber and YouNow streamer. Greg started a campaign in 2016 to convince her to get help for her alleged anorexia. All throughout Eugenia Cooney's YouTube career, she has received criticism about her thin frame, sometimes even being accused of starving herself or suffering from an eating disorder. Eugenia consistently replied to these claims by saying that's just how she is. Afterword, Greg and Eugenia had a few short twitter interactions in May and June. 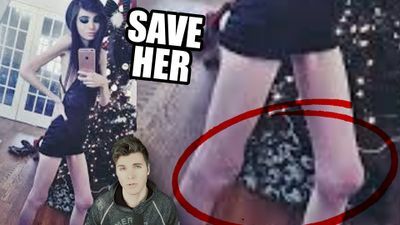 On September 10, 2016, Greg uploaded "Please Help Eugenia Cooney" to his Speaks channel. In the video, he says Eugenia does not live with her mom anymore and now does not have a positive influence to tell her to eat enough food. He points out people are commenting about her recent weight loss. He concludes it is now time to be concerned for Eugenia. He says he is scared for her and if something happened to her, he does not want his last video about her to be supportive of her "apparent suicide". He says he tried direct messaging her privately on twitter. The first message asked if she talked to a doctor about her health. Greg says she replied saying she is fine. He messaged her again saying his wife has an iron deficiency and is doing better. He suggests she get her iron levels checked. 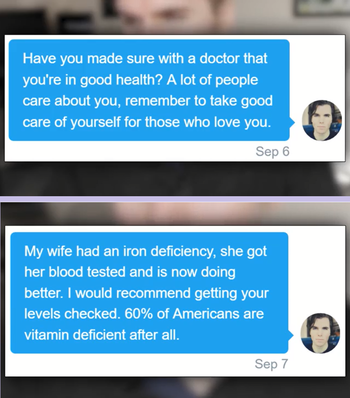 He explains in the video he told her this because he thought if she went to a doctor for that, the doctor would tell her she needs nutrients. He says she responded saying her doctor is okay with everything. Greg says he is pretty sure that doctor should be fired. Greg says the evidence of Eugenia's condition is in her photos. He shows mirror selfies she has taken and zooms in and analyzes her body parts, pointing out how thin they are. Like his previous video, he google searches "anorexic person" and compares what he finds to Eugenia, only this time suggesting Eugenia is thinner than the woman in the anorexic image. On March 5, 2017, Greg hosted a debate with YouTuber Jaclyn Glenn on his wife's Younow account. An hour of the debate was dedicated to Eugenia. Jaclyn said she did not want to talk about Eugenia because she already explained in her video about Greg's Eugenia videos that Eugenia deserves respect and privacy, but Greg insisted on talking about her. Jaclyn said hounding Eugenia with videos, then saying he was not going to talk about Eugenia anymore only to start talking about her in a negative way and make fun of her again came off as bullying. Greg defends his videos by saying Eugenia hurt people by causing them to starve themselves. He also says the like to dislike ratio on these videos are overwhelmingly positive and that medical professionals he talked to thanked him for these videos. Jaclyn says she feels that the stories sent to him about how Eugenia hurt people are somewhat solicited because he re-tweets them and that encourages people to tweet these things. She says she is willing to guess a large percentage of them are exaggerated because they want Greg's validation. Greg responds that he didn't say Eugenia's name, he just said "let me know if anyone's cause you to have an eating disorder." Jaclyn responds that he's made so many videos about Eugenia that there is no question about who he was talking about. She gives the example that if she tweeted, "reply to this tweet. 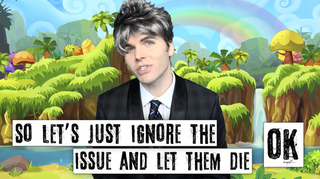 Let me know if Onision has ever made you feel bad about your body." that she would also get many responses. Greg says he would like to see those, but Jaclyn says that would not be fair. She mentions Joy talked about some being suicidal over something he said in a video, but she doesn't listen to stuff like that because it's being publicized to attack a person rather then to promote a specific cause. She reads a tweet he made, "You can be upset at people that shame your body, your mind or life, but if you are confident they will have no power over your happiness." She asks if this applies to people that watch Eugenia or just people that watch his videos and feel bad about them self. He asks why would someone feel bad if they watched his videos. She replies because you call them Shrek body, really thin, or points out their acne. Greg says he has acne and he did not call his audience Shrek, he called Trisha Paytas reminded him of Fiona, Shrek's wife, as a joke and many people thought it was hilarious. (Admin note: He did say to a fan they have a "Shrek body" a few months before this debate in a body rating video, then talked about it again defending doing so in the video "I'm Done Making These Videos..." - Source) ) He says it's funny to talk about a public figure that way. He says if he pulled up a picture of a random fan and tells them they need to lose weight that might be good for them. He says for every person that said "this person made me starve myself", there are an enormous amount of people that say he helped them accept their body the way it is. Jaclyn points out the second part of the tweet, "if you are confident they will have no power over your happiness", and says it's hypocritical if that only in defense of himself and not Eugenia. He says he's doing body positive videos and the only person that could be triggered by him is someone who is about to get diabetes, but with Eugenia she triggers people to want to look like their about to die. Jaclyn brings up the Cooking Show video Greg made about Eugenia. She says it was cruel. Greg replies by saying he has two sides of himself that are at war, she says that;s the definition of being hypocritical. Later that day, Eugenia broadcasted on Younow and talked about the situation. She said she email Greg asking him to stop making the videos and he replied saying he understood, but told her she was still triggering her fans and she shouldn't do that. She says she never tells people to be like her or look like her. She is glad he said he would stop and she believes he will stop. She compliments Jaclyn on doing a good job in the debate. She reads a comment saying don't believe Greg, he will make similar videos and indirectly mention her. Eugenia says she believes he will stop. She reads a comment: "you made it very clear before you didn't want that. If he stopped after you emailed him it's probably because he knows you could sue him." Eugenia asks viewers if she was not making it clear enough before that she wanted him to stop making the videos. She said she thought it was obvious because of her talking about it on Younow and reacting to it on twitter. She says she watched some of the debate and it was hurtful to her when he said things like she was triggering and killing people. She says that gets her really upset because she doesn't want people to think she has bad intentions or want to hurt people. Eugenia says sometimes she would see comments from people accusing her of teaming up with Greg to get views. She says she thought it as obvious she was upset with what was going on. She says she wishes people would understand. On March 24th, people began to notice Greg had deleted all 15 of his videos that focused solely on Eugenia. On March 25, 2007, Greg began uploading his deleted Eugenia videos to his Encore channel, his least popular active channel, as a series of episodes titled "Please Help This YouTuber Heal". He avoided using Eugenia's name in the titles and descriptions, most likely to avoid Youtube from automatically demonetizing the videos again. This page was last modified on 27 March 2017, at 19:24.